Elizabeth Farren (c. 1759 – 23 April 1829) was an English actress of the late 18th century. Both of her parents were actors and as a child she acted with her mother and sisters in juvenile parts. She first appeared on the London stage in 1777 as Miss Hardcastle in She Stoops to Conquer and the following year appeared at Drury Lane which, along with the Haymarket theatre became her primary venues for the rest of her acting career. She had over 100 characters in her repertoire including Shakespeare and various contemporary comedies and dramas. She was often compared to Frances Abington, who was her only real rival. Her last appearance was in April 1797, two months before her marriage to Edward Smith-Stanley, 12th Earl of Derby. They had a son and two daughters. On 1 May 1797 she married Edward Smith-Stanley, 12th Earl of Derby (1752–1834) by whom she had a son and two daughters. She died on 23 April 1829 at Knowsley Park, Lancashire. She had a short sentimental attachment to John Palmer and was admired and followed by Charles Fox. Lord Derby reportedly treated her with more respect than was sometimes given to ex-actresses. Hazlitt speaks of "Miss Farren, with her fine-lady airs and graces, with that elegant turn of her head and motion of her fan and tripping of her tongue" (Criticisms and Dramatic Essays, 1851, p. 49). Richard Cumberland (Memoirs, ii. 236) mentions her style as "exquisite." George Colman the younger (Random Recollections, 1. 251) says of "the lovely and accomplished Miss Farren" that "No person ever more successfully performed the elegant levies of Lady Townly." Tate Wilkinson credits her with "infinite merit" (Wandering Patentee, iii. 42). Boaden (Life of Siddons, ii. 318) says that after her retirement comedy degenerated into farce. 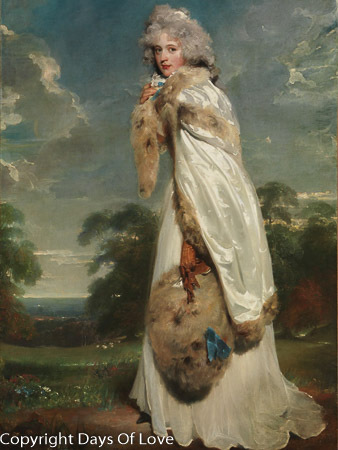 Horace Walpole spoke of her as the most perfect actress he had ever seen, and Mrs. Siddons, on the day of Farren's marriage, commiserated the loss of "our comic muse." Farren reportedly had an affair with Anne Seymour Damer.